I went small for my first issue of Cavalcade Comics and my new vintage comic throwdown feature. Today, I thought I’d go the opposite way and go BIG for issue #2. WAY big. Back in the 70s Marvel had the license for both Godzilla and Shogun Warriors comics. Yet, as far as I know, they two never met. Why? Why, Marvel?! Today, I rectify that gross oversight. Check out my second Vintage Comic Throwdown in Cavalcade Comics #2; Godzilla vs Shogun Warriors. This has sort of a vintage Pacific Rim vibe, doesn’t it? 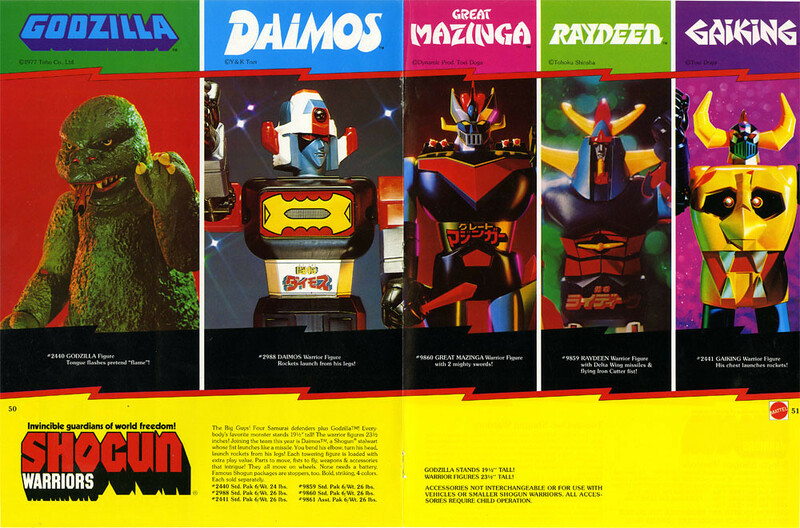 I loved the Shogun Warriors cartoons and toys. And some of the later Godzilla movies were balls out wacky awesome. And it seems fitting that Godzilla himself was marketed under the Shogun Warriors toy banner for his famous fire breathing 19 inch figure. Like I said, total pop culture synergy. So, you’re welcome for the awesome epic monster/robot battling. 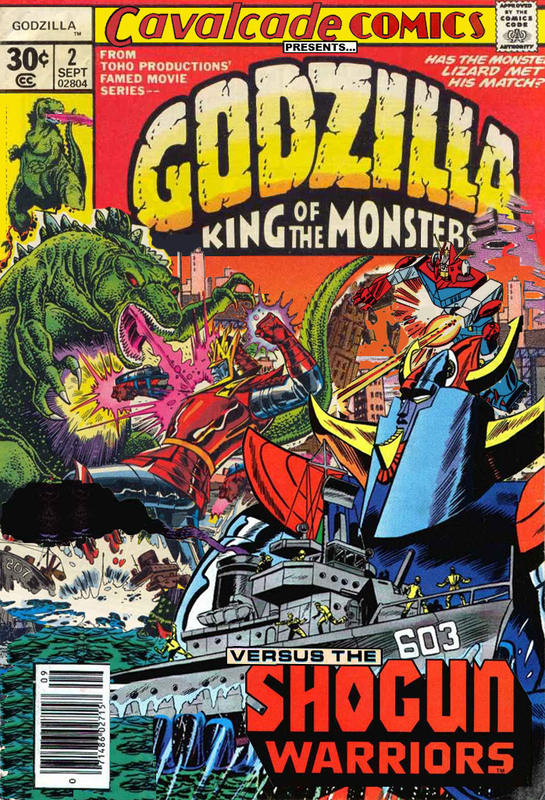 For those keeping score at home, I mashed up the covers for Marvel’s Godzilla King of the Monsters #8 and Shogun Warriors #8. I may have also pulled in a stray robot from Shogun Warriors #6. This is week 3 of our Atomic Weeks in which we are celebrating the upcoming episode 250 of our friends The Atomic Geeks. This week we are joined by Christian Nielsen in order to discuss late night talk shows. We talk about our history watching these shows and then we start discussing our favorite and least favorite hosts. There are several “geek confession” style reveals and we all espouse our mutual love of Conan O’Brien. Lots of fun to be had, plus, check out the intro to the show this week. It may be one of the best we’ve ever done. Download this episode from iTunes or listen to it on Feedburner. Or listen to it online right here. In my reviews for Dynamite Comics’ The Bionic Man and The Bionic Woman titles, I mentioned that they are separate timelines. The Bionic Woman happens years after the end of The Bionic Man title. The point of today’s comic is supposedly to bridge the gap between the two titles and see why Jaime Sommers has “gone rogue” from OSI. Today I’m reviewing Dynamite’s The Bionic Man vs The Bionic Woman mini-series. This 5 issue mini is written by Keith Champagne and drawn by Jose Luis. At first glance the art is fairly strong so let’s see how the story holds up. Since this is a short mini, this review is going to be a little shorter. Essential Plot: A giant bionic guy is killing people and stealing their hearts. Jaime and Steve have to stop him. Characters: The story, of course, focuses on Steve and Jaime, and they are portrayed roughly the same as they are in their own titles. We also get a cameo from Oscar. And another “new” bionic menace is introduced. Again. Story: I guess I liked the story, with the bionic serial killer, but honestly, it’s a little tired. Another bionic menace that only Steve and Jaime can handle. The first story arc in The Bionic Man involves a prototype bionic man wrecking havoc and the second story arc involves bionic Bigfoot creatures. The Bionic Woman comic involved an organization stealing bionic parts that eventually get used to create a bionic bad guy. This story device has become a little old. Part of the problem I think is that Jaime and Steve are a little too powerful at this point. It’s like having every Superman story feature an evil Superman. Let’s think of something else. Differences from the TV show: Steve Austin has only one bionic arm in this comic (see below) as opposed to the two he started with in his own comic. Otherwise, the differences that I mentioned in the previous comic reviews still stand. Art: The art is actually pretty good. Jose Luis brings some good action art and the characters are drawn faithfully. I even like the design of the evil bionic serial killer. Lots of pretty art to look at in this comic, even if the story is constantly trying to put you to sleep. Overall: Overall, I was disappointed. While the art is great, the promise of this timeline and title bridging story was completely wasted. In 2011, Dynamite Comics started up a new Bionic Man comic featuring a story taken from an unproduced Kevin Smith movie script. The comic did well and eventually Dynamite decided to spin off the character of Jaime Sommers into her own comic, The Bionic Woman. This comic is written by Paul Tobin and drawn first by Leno Carvalho and then followed in committee by Juan Ramirez and Daniel Leister. As of this moment, it looks like issue 10 will be the final issue. The Six Million Dollar Man Season Six has launched, the original Bionic Man title is done and so I assume this title is finished as well. If SMDM Season Six does well, I assume we are going to see a The Bionic Woman Season 4. Essential Plot: The Bionic Woman doesn’t start directly after Sommers’ appearance in The Bionic Man. Issue #1 jumps about 5 years into the future. Jaime is already bionic. Her accident happened many years ago. Jaime was an OSI operative and something happened that caused her to quit OSI and essentially “go rogue”. This same split happened with her and Austin with whom she previously had a relationship, but doesn’t anymore. The first issue picks up with Jaime on the run from an organization that is tracking and killing people with any sort of bionic enhancement. Most of these issues involve information gathering and Jaime tracking down man after man in order to discover who this shadowy organization is that is trying to kill her and take her bionics. Throughout the story she is accompanied by a friend named Nora and we get several cameos by Steve Austin. Characters: This particular Jaime Sommers is characterized as a very accomplished covert agent, highly trained in hand-to-hand combat and very proficient in the use of her bionics. She is also very proactive in her search for the people trying to kill her. This is very different from the TV show and I have to say, I like the difference. It keeps the story moving forward and gives us lots of action on the way. The Nora character that tags along is sort of annoying. Jaime is constantly having to make sure she doesn’t die. Story: I liked the idea of a shadowy group killing and stealing bionic implants for sale on the black market. I was not in love with the Nora character tagging along nor was I in love with the completely unnecessary cameos by Steve Austin. They seemed to serve no purpose. But the overall story is pretty solid, even if a lot of the page to page dialogue is groan inducing. Differences from the TV show: Jaime is given full bionic implants in both legs and the right arm. She has the bionic ear, like in the TV show. It is also implied that Jaime may also have bionic eyes, which were not a part of the TV show. Another very cool enhancement that this Jaime has that not even Austin gets is the ability to interface wirelessly with computers. It’s an ability that may have been borrowed from the TV show, Jake 2.0, which was a spiritual grandchild of the original Six Million Dollar Man (Lee Majors even made an appearance). This past weekend the members of the Nerd Lunch Podcast and the Cult Film Club podcast descended on Atlanta for a meetup. This was the first time several of us had seen each other in real life. Here are some photos commemorating this historic nerdy and cultish event. The first place we all went together was, of course, The World of Coke. 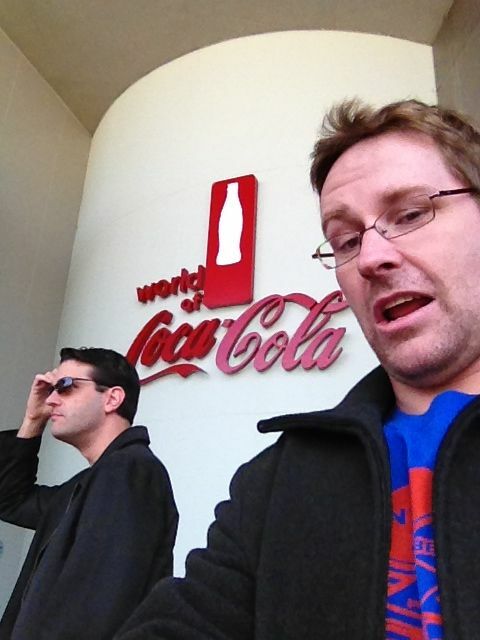 Here I am at the entrance to the World of Coke getting photobombed by CT. The entire Nerd Lunch podcast crew. Together again for the first time. And on a Coke sofa. The entire Cult Film Club crew together in the gift shop at The World of Coke. 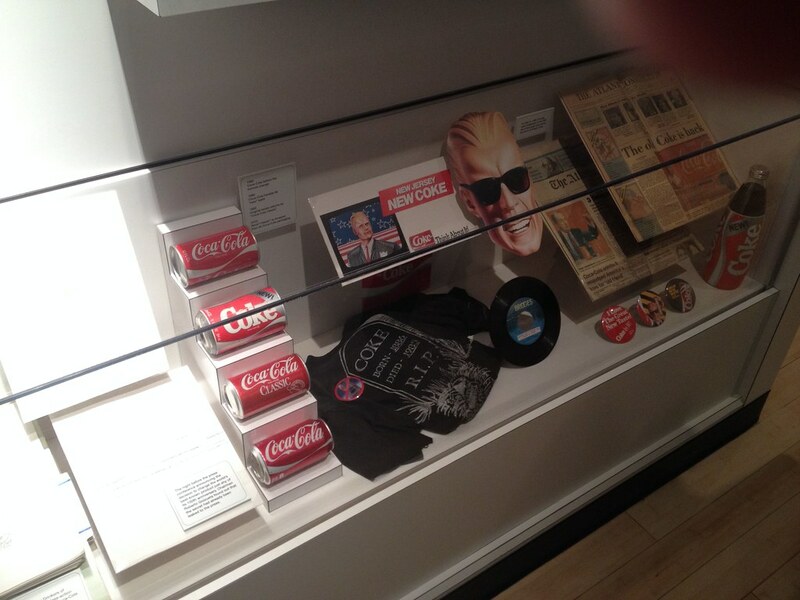 Surprisingly, the museum actually had a small display dedicated to New Coke, of which you know I’m obsessed. I love vintage comics. I especially love vintage comics covers circa the Golden and Silver Age. That era of comics had such a cool style and their covers were always bonkers. Like crazy as balls. And there were always such cool looking match ups on the covers of these comics. So, I was playing around with Photoshop one day (creating the banner above) and I thought I’d start a new photo series where I play around with old comic covers and come up with awesome character meet ups that never happened. Stuff like gunfighters, monsters and movie characters that I thought should have meet up but never did. I decided to call the series Vintage Comic Throwdowns. So for my first issue, I went back in time to 2010. For Billy the Kid Week that year I reviewed a little known piece of D-movie history called Billy the Kid vs Dracula. I sorta fell in love with the idea of that movie so I created a poster and casted a modern version of that movie right here. I even wrote a fanfiction.net story about that concept. So yeah, wet, sloppy love, me and that concept. And that is what I thought should be the focus of the first issue of what I decided to call Cavalcade Comics. So here is my comic book interpretation of Billy the Kid vs Dracula as it would have looked back in the 70s (during Marvel’s Tomb of Dracula era). I know I personally would have snatched this right off the comics rack had I found it when I was a lad. The idea of my Cavalcade Comics title is that it’s an anthology title similar to Action Comics or Detective Comics but doesn’t focus on one character. It’s a revolving door of awesome characters as you will soon see. Much like comics did back in the Golden Age. I’ve mostly finished with the first few of these issues already. You are going to see all types of characters showing up like Robin Hood, Frankenstein’s Monster, Godzilla, Wolf Man, Sherlock Holmes and possibly even James Bond. It should be a lot of fun. 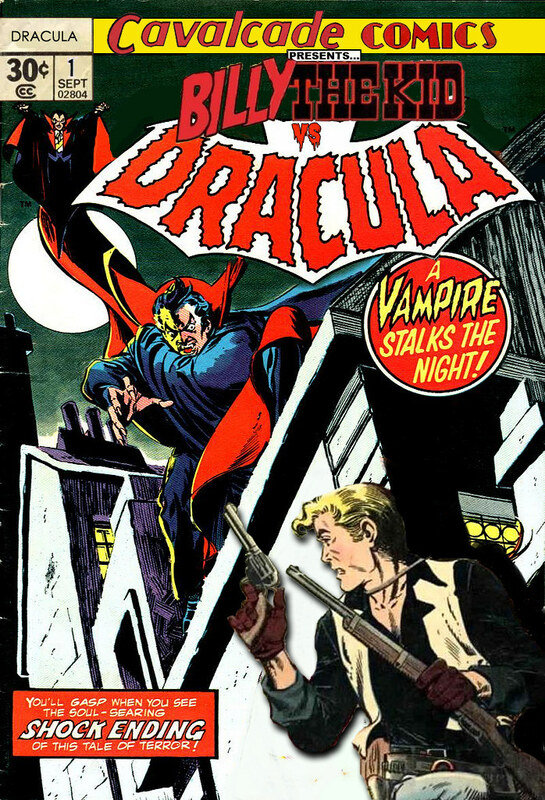 For those interested in some “behind the scenes” information on the above cover, I used Marvel’s Tomb of Dracula #26 for the main background image and then used Billy from Charlton’s Billy the Kid #10. The “Billy” in the title logo came from issue #10 as well but “The Kid” came from a different issue. I think it was issue #80. So I hope you are as excited about this feature as I am. Expect Cavalcade Comics issues #2 soon! This week on Nerd Lunch we are joined by returning guest Claymation Werewolf and first time guest Miss M from Diary of a Dorkette. We are also returning to one of our favorite topics here on Nerd Lunch, Fan Fiction Review. We first did this topic back in episode 18 and then followed it up in episode 62 and then it returned again when the Atomic Geeks took over our show for episode 95. There is so much material to mine with these Fan Fiction Reviews. Seriously. So much fun. This week we change up our approach a little bit. You’ll have to listen to find out how, but it’s a lot of fun.